From earliest childhood, Douglas Bishop possessed three qualities which contributed to his becoming a student of the archaic pan flute; an insatiable interest in music, a proclivity for focus and concentration, and a burning desire to explore and understand the true nature of things. These attributes have brought Douglas through numerous physical, musical and spiritual journeys in his 38+ years with the pan flute. Douglas began his studies with the pan flute at the age of ten, and he has honed his skills by learning the techniques of performers he encountered during his journeys of self-discovery. Douglas's interests in the pan flute, history, and ethnomusicology have taken him to many countries, and this extensive period of travel and study has fostered the development of his diverse repertoire. Douglas Bishop has performed in numerous musical appearances, from shopping malls and open-air markets worldwide to religious institutions, weddings, funerals, eldercare communities, concert halls, art galleries, libraries, and festivals of every description. Douglas has also demonstrated his artistic flexibility in the recording studio, by performing on such varied albums as "Dragon Dreams", a collection of traditional Mexican songs and original music by double platinum guitarist / singer / songwriter David Salazar, and "Didgeridoo Dreamings: A Shamanic Journey", an album of original New Age-style compositions by Australian didgeridoo master Phil Jones (of "Quintessence" fame). Douglas Bishop has appeared with the Andean band Imbaya at the 1994 Fiesta de Santa Fe, and with David Salazar & Gerard Moreno in Santa Fe's renowned Dragon Room Bar of the Pink Adobe Restaurant. Douglas has also appeared on the German documentary, "Bilder Aus Deutschland", the Vermont Public Access TV program, "The Artful World", and the University of Vermont's 2001 short documentary, "Operation: Street Performer". Douglas Bishop now lives with his wife and children in Vermont, where he is best known for his past work as a performer on Burlington's Church Street Marketplace (read a letter of appreciation from Burlington's former mayor). In the autumn of 1996, Douglas collaborated with hammered dulcimer specialist Arlen Oleson on "Further Beyond the Pale", a compilation of Celtic and Renaissance music. Douglas Bishop and Arlen Oleson subsequently performed with guitarist Suzy Hurd and bodhran player Anthony Santoro during First Night 1997 in Burlington. Douglas's first CD, "Origins of a Minstrel", was released on November 9th, 2000, and he has also released "A Panflute Christmas", a compilation of Christmas songs performed as pan flute solos. Employing his keen mind, sharp investigative skills, and wide knowledge of many academic disciplines, Douglas has also distinguished himself in the world of the pan flute as a dedicated researcher and educator. Douglas is the author of "A Worldwide History of the Pan Flute", the Internet's most extensively researched and complete work concerning the pan flute's history. 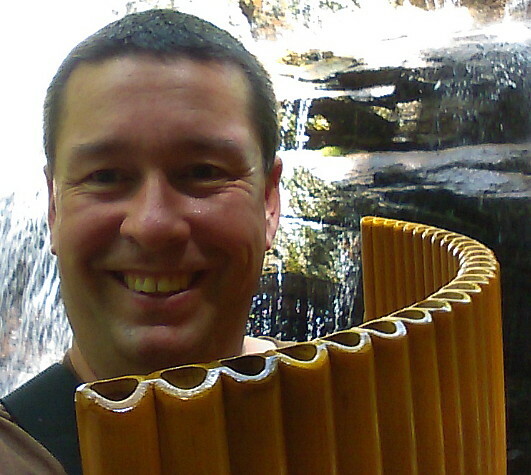 In 2003, with the introduction of Pan Flute 101, Douglas became the first panflutist to make possible the learning of the pan flute by anyone in the world, regardless of financial status or geographical location. Douglas is also the creator of "The Hall of Panflutists", the most complete pan flute portal to be found online. With 450 performances in 2007 alone, Douglas' hectic performance schedule is the busiest of any career panflutist in the world. Douglas' current focus is live performance in cultural and artistic capacities, as well as his unique blend of music recital and lecture in educational capacities. If you are interested in booking Douglas Bishop for an event, or have other questions, feel free to e-mail him at panflutejedi@gmail.com.